Chipping is much like putting but it requires loft - or flight in the air - and is used to get over something. Remember, you chip to get over things, like a sand trap, water, or rough. If you are not chipping to get over something, then consider putting it. During chipping, you may chip to stop, check, back up, walk, or run the golf ball. While chipping, imagine tossing pennies to a specific spot. That is the image your mind should have while in the chipping process. Once you hit the spot, how far will the ball need to roll to get to the cup? In chipping, ball position is very important. Did I say it’s very important? Well, it really is! The main focus in golf chipping is to strike the ball solidly. To do this, the ball must be placed (for me) just right of the right foot (or left of the left foot - if you are left-handed). I line the ball up to my right little toe. This will give me solid contact. Now, all I have to do is find the line I must hit the ball on and do it. The face of the golf club can be adjusted - open or closed. Properly grip the golf club. Then rotate the face of the golf club so it lays flat relative to the ground, keeping the grooves parallel to your feet. This will cause the ball to fly high in the air. If you rotate the face of the golf club so that the face is less flat than just described, then club is considered closed. 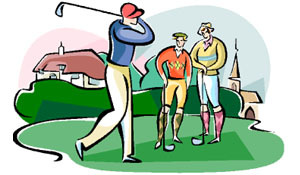 The number of the golf club will produce this same result; a higher numbered club will cause the golf ball to fly higher than a lower numbered club. A 3-iron club will fly higher than a 2-iron or 1-iron. Your left wrist (for right-handed players) should never move during the chipping process. If it does you will blade the ball. Do you want to stop the ball? If so, you must impart spin on the ball during chipping. Ball position and acceleration through the shot will start the ball spinning enough to stop.